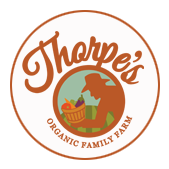 Welcome to Thorpe's Organic Family Farm! Our family owned and operated farm encompasses a wide variety of organically managed, bio-diverse land in East Aurora, NY, and a citrus grove in Florida. We grow over 300 varieties of fruits, vegetables, hay, and grain, all certified organic through NOFA-NY, in addition to organically fed poultry, beef, and pork. You can find our products in our farm store, open year-round, 6 days a week, and in our CSA shares.